Latest predictions dash hopes that industrial carbon dioxide emissions have peaked. Global industrial emissions of carbon dioxide are likely to have risen by 2.7% in 2018 to reach an all-time high, marking a second year of strong growth after a brief period of relatively stable emissions, an international consortium of scientists reports. The findings were released in a trio of papers1,2,3 by the Global Carbon Project on 5 December at the 24th Conference of the Parties to the United Nations Framework Convention on Climate Change (COP24) in Katowice, Poland — and they underscore the challenge of reining in fossil-fuel consumption. The scientists also said that deployment of renewable energies such as wind and solar power is increasing rapidly around the world, but not fast enough to displace coal use in places such as India and China or a growing global demand for oil and natural gas. 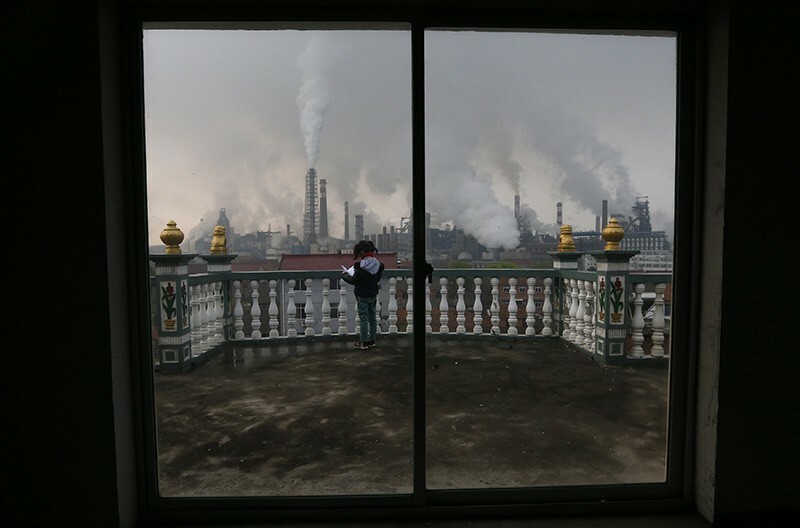 The projections indicate that industrial CO2 emissions will hit an all-time high of 37.1 billion tonnes this year; the total, including CO2 emissions from deforestation and other activities on land, will reach 41.5 billion tonnes — also the highest since record began. CO2 emissions grew by 1.6% in 2017. The spikes in 2017 and 2018 follow a three-year period in which emissions growth slowed to a crawl (see ‘Carry on rising’). “We had hoped that emissions had peaked beginning in 2014, but with strong growth two years in a row, that is clearly incorrect,” says Rob Jackson, an Earth scientist at Stanford University in California and chair of the Global Carbon Project, which tracks emissions and changes in the Earth's carbon cycle. But the global economy is becoming more efficient, with economic growth outpacing emissions; the researchers report that 19 countries experienced economic growth while reducing their emissions over the past decade. 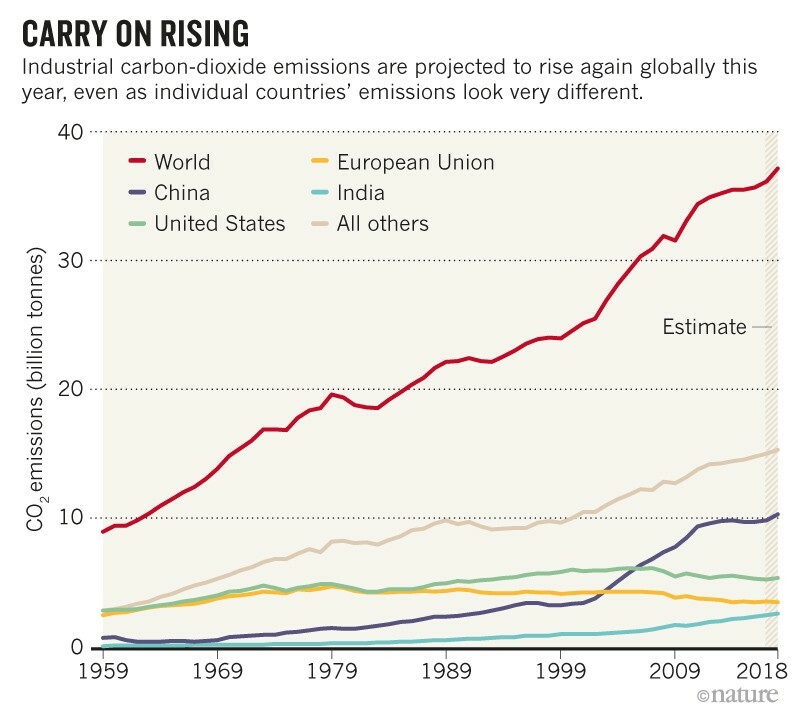 The biggest driver of emissions growth is a rise in coal consumption in China, which accounts for more than 46% of the projected increase in industrial CO2 emissions in 2018. India’s emissions rose by 6.3%, owing to strong economic growth and increasing coal use. And in the United States, where emissions have fallen over the past decade, they are projected to rise by around 2.5%, partly due to increased energy consumption during a cold winter and hot summer. Fossil-fuel infrastructure is still expanding, the scientists say, particularly in developing countries. Overall, Jackson notes, humanity’s energy portfolio remains as carbon intensive as it was three decades ago. Peters says that the long-term trend is hard to decipher, because carbon emissions still rise and fall on the basis of economic activity as well as weather trends. Since 2010, he says, global emissions growth has averaged about 1% per year, compared with 3% per year in the 2000s. That’s progress, he adds, “but it’s still not good enough”. Le Quéré, C. et al. Earth Syst. Sci. Data 10, 2141–2194 (2018). Figueres, C. et al. Nature 564, 27-30 (2018). Jackson, R. B. et al. Environ. Res. Lett. https://doi.org/10.1088/1748-9326/af303 (2018).